Get pampered in luxury within the finest ambience in Mumbai Ramee Guestline Hotel is a 4-star establishment which is conveniently located at a distance of 5 km from Chhatrapati Shivaji International Airport, making it a suitable choice for both leisure and business travellers. Juhu Beach (2 km) is located nearby from the hotel. The hotel offers a fitness centre, luxurious Reborn Spa and wellness centre on chargeable basis along with a swimming pool. It offers a business centre on additional charge and conference hall for meetings and corporate and private events. Other facilities include 24-hour front desk, concierge service, tour desk, baggage storage and free parking. Moreover, it provides currency exchange, doctor-on-call facility and car rental service. In additions, it offers activities like karaoke for recreational purposes. The hotel offers 87 spacious rooms, which are segregated as 52 Club Rooms, 27 Executive Rooms and 9 Junior Suite Rooms. Each room has a flat-screen TV and a DVD player. Every room is equipped with a desk, in-room safe, high-speed wireless internet, minibar and tea/coffee maker. The hotel also provides en-suite bathrooms with shower facility and other bathroom amenities. Laundry service is also available. The hotel features a contemporary Indian restaurant, Its Mirchi, which offers delectable delicacies from all over the country. 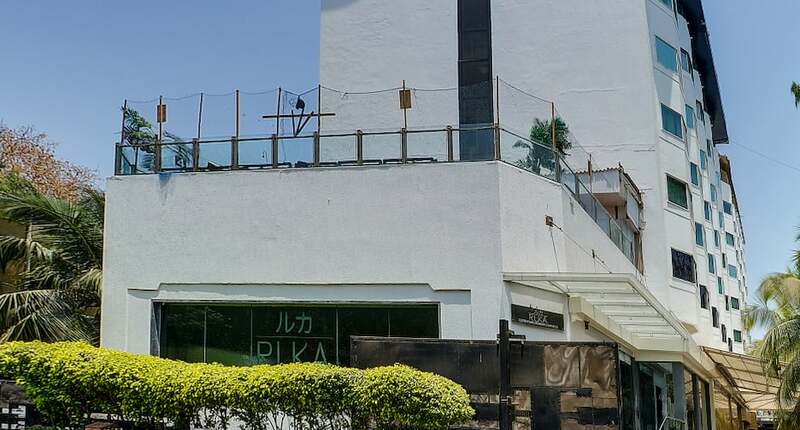 Guests can also enjoy a fine selection of drinks at a roof-top bar, R-Adda. The hotel is 4 km from Andheri Railway Station, 5 km away Chhatrapati Shivaji International Airport and 19 km from MSRTC Mumbai Central Bus Depot. Some of the major attractions near the hotel include ISKCON (650 metres), Juhu Beach (2 km), Versova Beach (6 km), Pali Hill (6 km) and Powai Lake (14 km). For business travellers, Bandra Kurla Complex is 9 km, the emerging industrial hub Powai is 11 km and Bhandup West is 17 km from the hotel. What people love the most about this property is its great location and classy ambience. Book now and enjoy world class services at Ramee Guestline Hotel, Juhu. Full refund if you cancel this booking by 24-Apr-19 12:00 PM IST. First night cost (including taxes & service charge) will be charged if you cancel this booking later than 24-Apr-19 12:00 PM IST. This spacious room is furnished with a king-size bed, covered with rich fabrics and cushions. It has amenities that include a Wi-Fi Internet connection on a chargeable basis, color television, air-conditioning and 24-hour room service. Reason For Rating : The location of the Hotel is very nice. Staff, Service and food everything was good. We loved our stay there and would recommend others to go and enjoy their hospitality. Reason For Rating : The price is too high for the kind of hotel it is. 6000 bugs is just a lot of money for this hotel... Totally not worth it. 3-3.5k is more than enough. Its a total thug...if you ask for a bottle of water they will cost you 120rs. I mean this insane...what taxes makes a 20 rs bottle cost 120. Ridiculous it was. The only good thing about this hotel is that it is near beach and nothing else. Not at all happy with this experience. Feeling like being fooled. Reason For Rating : Greaat location. Reason For Rating : Basic room fuctions and cleanliness can be improved dractically. Reason For Rating : Mention the requirement of a security deposit of Rs.2000 when checking in. What's Good: Good in all respect. Reason For Rating : Comfortable, good location, awesome food, best service. Reason For Rating : Good service..and good location..
What's Good: Overall experience was good. What needs to improve : Everything was good. Nothing to complain about. Reason For Rating : Rooms were good. What needs to improve : Tantantan hotel experience was awesome ansd joyful. Reason For Rating : Awesome Gym, swimming pool, spa, Hotel staff is also supportive, service hot and fresh food.Tantantan is best and not to miss experience. Reason For Rating : Good location and Nice Rooms. However, few processes can be worked upon. Reason For Rating : Very good!! Had a great time there. Reason For Rating : wonderful holidays tour. the best one property. Services is very good . best one food quality & quantity. this is memorable vacations. we will suggest my friends & relatives for your sight & hotel also. We are happy for your services. Thank you for your services. What's Good: The best staff and hospitality. Reason For Rating : Awesome services.Very humble crew.Any issue immediate solution with full transparency. Overall satisfaction thanks! Reason For Rating : Overall all good..
Reason For Rating : The rooms were very comfortable, neat and clean. The food and buffet breakfast was really tasty and awesome. Reason For Rating : Always had to wait atleast 20 mts to check in even after coming after 2pm. Reason For Rating : Best part is that the property is close to beach and very approachable to different landmarks overall good. Reason For Rating : Location is good for stay but Rooms are too small and service and staff behaviour is not like 4 star hotel. What needs to improve : Room uncleaned. Bad room service. Very noisy activity which can disturb any neighbouring hotel stayer. Reason For Rating : Room was uncleaned. Toilet was uncleaned. Minibar, a half consumed water bottle was present. On the first night, I couldn't sleep after 3 am because my neighbour room was taken out for very boisterous late night party not less than 15 young minds, continuing till next day 7am. I had to change the room. The room which I got was also not cleaned. Room service was extremely bad. Reason For Rating : Plz upgrade the level of Bathrooms...Washbasin was Very stinky... and Bathroom fittings seemed like they were replaced a decade ago. Reason For Rating : get rid of the party lounge R-Adda on the 6th floor. Music is disturbing at night. What's Good: Location and amenities. Reason For Rating : Great experience. What needs to improve : The rooms were bad.The bathroom was very old and dirty rooms were not at all good at all. Morning breakfast was very sad. Reason For Rating : The rates where comparatively good from the sites i checked. Reason For Rating : nice hotel with nice location, but entry of this hotel is not nice, otherwise rooms, service and food quality is best. What needs to improve : Breakfast was not in the 1 night package. Also water bottles were charged !!! What's Good: Its an overall good hotel, service staff is polite and helping. Definitely worth staying. What's Good: Hotel is in poor condition. Staff is rude and not professional. room service is bad. Food taste is good but very few options. Good hotel with good rooms. Had booked around 22 rooms for an event and the food was amazing and restaurant staff managed it very well. Chef Prem took very good care of all of our needs and ensured we got everything we needed. Veena, who is the banquet manager was helpful for the first couple of days, but on the final day we were promised the banquet, but she gave it away to someone else and this caused a lot of chaos for us. The worst thing that could happen to a supposed 4 Star hotel was that they ran out of water coz of some pipeline bursting somewhere and since the admin staff is run by people who couldnt think of a back up plan, my guests had to face this inconvenience. Add to this the blaring noise of their clubs that dont let you sleep coz they didnt consider that the noise from one floor would hamper guests on another. When we went to pay them and spoke to them about the management about this they had no reply. All in all not the best hospitality and quite a frustrating stay for my guests. 2 stars for the food and Chef Prem's hospitality, and one star for the restaurant staff and the rooms. Good surrounding place and easily accessible to beach and market places.One think i loved about Ramee is their wide spread of breakfast tasty and delicious, rooms are fine. Reception staff is very helpful instead of being so much crowded they manage to arrange room for me, specially karishma was very helpful and polite through out my stay she always assisted me.Good hospitality service given by front office.Overall excellent experience. Top notch customer service and amazing cuisine in It's Mirchi. Well known for its dinner buffet. Decent ambience with friendly staff. For cricket fans, they do have great offers going on on dinner buffet as well as a special menu for IPL season. Definitely looking forward to visit again. Corner rooms are more spacious and quieter.